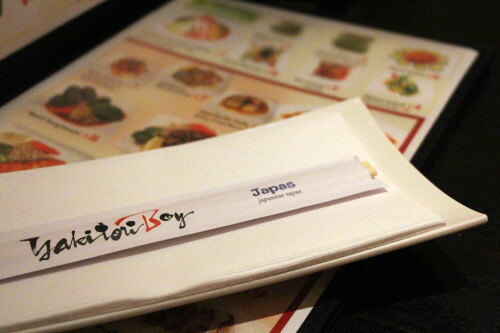 We found Yakitori Boy in the heart of Chinatown, surrounded by countless other Asian restaurants. Once we walked in, we realized that Yakitori Boy was different. It wasn’t just an Japanese tapas restaurant, but an entertainment destination: it was a restaurant, bar, and karaoke bar all rolled into one. The main floor had a quieter dining space, decorated in a sleek, modern fashion with beige seats and dark wood accents. 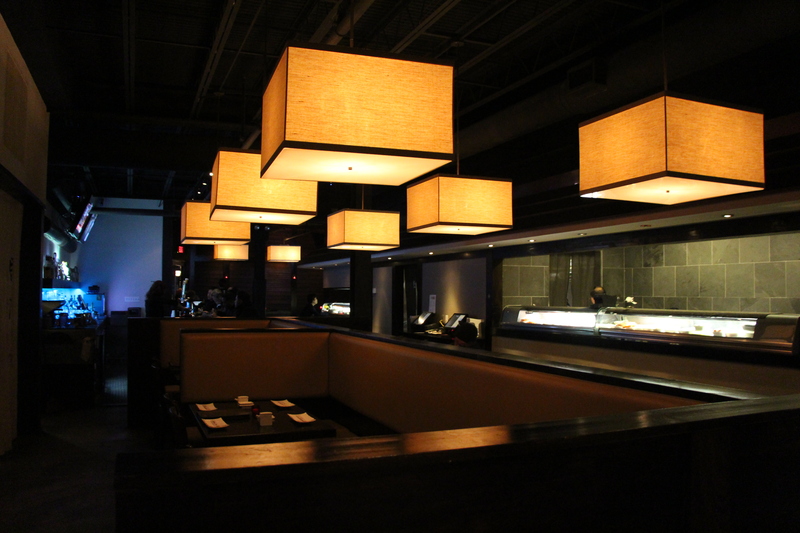 In addition to the standard dining tables, seating was available at the bar and a sushi bar closer to the entrance. In contrast, the top floor had a huge karaoke lounge, blasting music, strobe lights, and a hallway with private rooms for individual groups. Around 6 pm on a Friday, the bar was getting crowded, but the restaurant itself was not. We were seated on the quieter first floor, and opted for the five-course Restaurant Week menu. At first, we were confused; dishes such as steak, lobster, lamb chops, and crème brulee seemed out of place on a Japanese tapas-style menu. Upon further explanation, we learned that Yakitori Boy took its own spin on meats by cooking with Asian spices, and the crème brulee was for less adventurous Restaurant Week visitors. For our first course, we tried the yellowtail carpaccio and the tempura udon. The yellowtail carpaccio was presented beautifully on a long white tray. 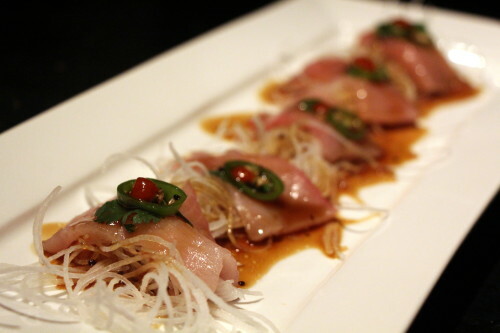 Five silky pieces of yellowtail were lined up on beds of crisp shredded daikon and soy sauce, then topped with thin slices of jalapeño. Although the jalapeño made the dish a touch too spicy for the less capable, the contrast of the crunchy radish, salty soy sauce, and smooth yellowtail made us enjoy every bite. 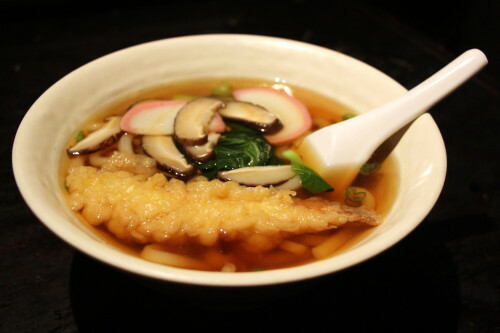 The tempura udon featured tempura shrimp, udon noodles, mushrooms, kamaboko (pink fish cake), and bok choy submerged in a savory broth. Although the tempura shrimp lacked crispiness after being submerged in the broth, the dish was hearty and well-seasoned. The thick noodles were soft and smooth, and the vegetables added texture to the dish. This could have easily been a meal in itself. 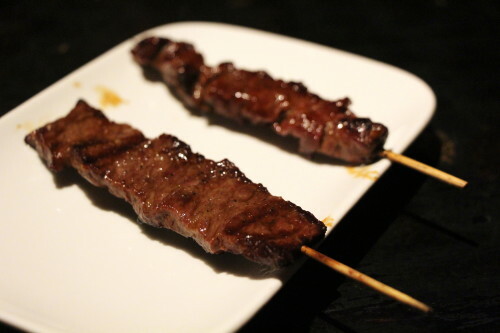 For the second course, we tried traditional “yakitori,” types of skewers traditionally served as a bar snack in Japan. Given their small size, these skewers led to the rise of cuisine called “Japanese tapas,” where Yakitori Boy gets its name. 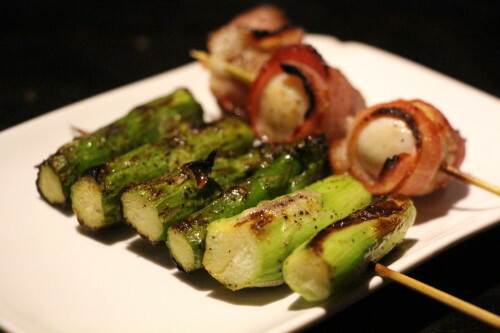 We tried the rib-eye, short rib, asparagus, and bacon and quail egg yakitori. The meats were flavorless and could have used a heavy dose of the Asian marinades intended for all the dishes. The asparagus was tender, but the seasoning was passable, merely absorbing the flame-induced char from the grill; a quick brush of miso butter or soy sauce-based glaze would make the skewer sparkle. However, the bacon and quail egg skewers were fantastic. Featuring a delicate, soft egg wrapped in crispy, unctuous bacon, these were full of flavor and extremely satisfying. We selected from a variety of sushi rolls for the third course. 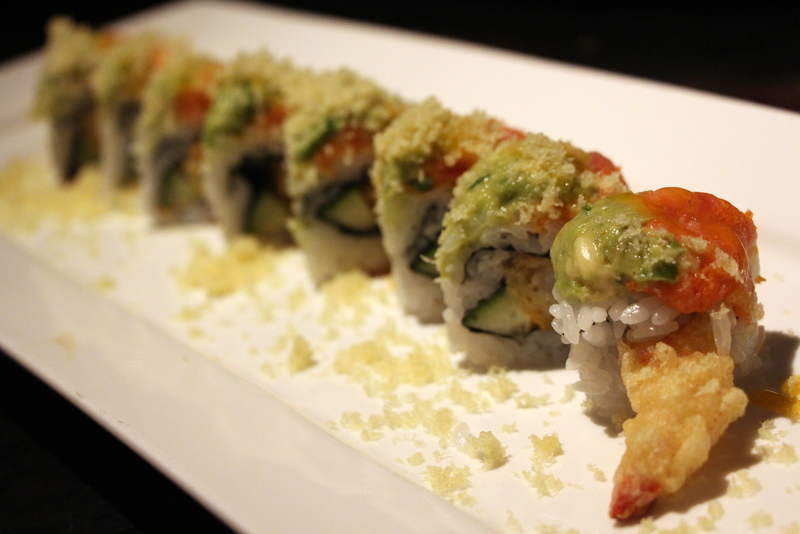 We first sampled the Tokai roll: shrimp tempura and cucumber topped with guacamole, spicy tuna, and tempura crunch, served with a mango sauce and a sweet soy reduction. While the guacamole was overpowering in terms of texture and taste and muted the other notes, the combination of flavors was creative. Additionally, the tempura crunch added a surprising element to the dish. 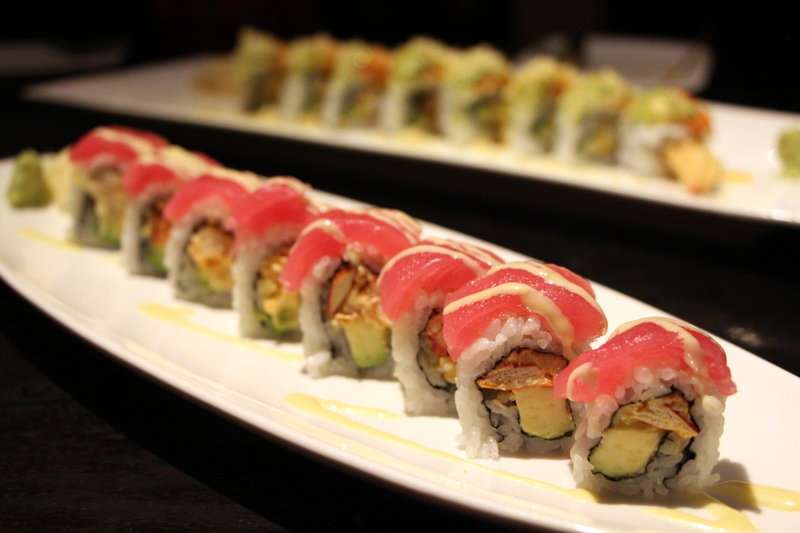 After, we tried the Red Atlantic roll: lobster claw and avocado within, topped with fresh tuna, and drizzled with a citrus-mayo glaze. With the bright pink tuna, orange lobster, and yellow-green guacamole, this roll was a work of art. It was much more well-balanced than the previous roll, and the citrus-mayo drizzle brought together all the flavors and kept our palates refreshed after each bite. The fourth course presented a myriad of more substantial platter options. We opted for the Chilean sea bass and the grilled whole lobster. 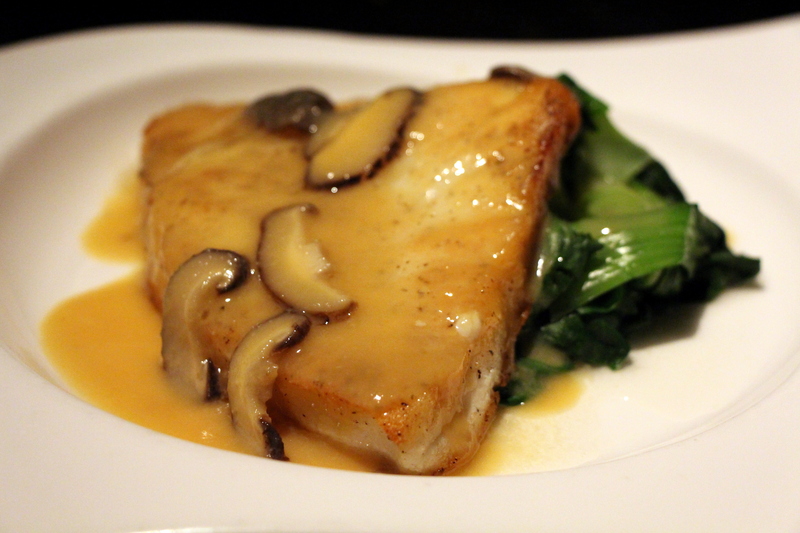 The sea bass (cleverly named to be more toothsome than its true name, “Patagonian toothfish”) came accompanied by mushrooms and boy choy in a golden miso sauce. The fish was perfectly flaky and melted in our mouths. It mixed well with the crunchy bok choy, and the thick miso sauce was savory and rich. 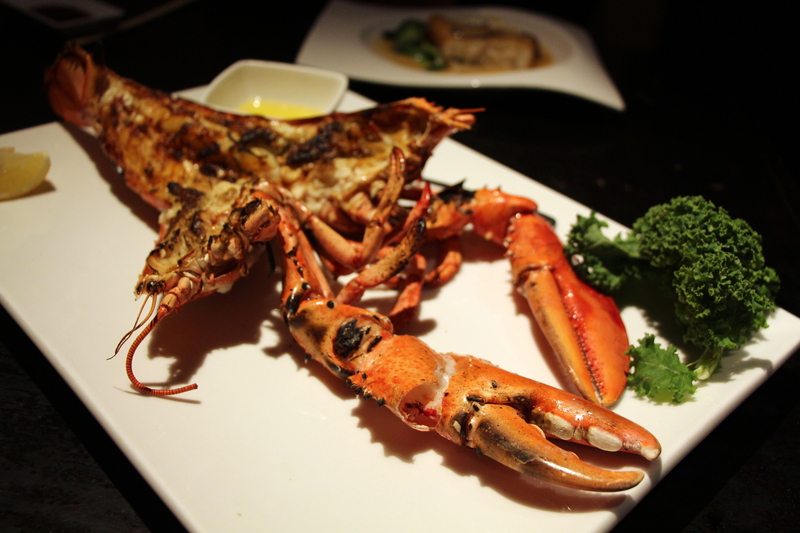 The lobster was an overwhelming sight, the massive crustacean blackened in areas where the grill charred it. Although the presentation was impressive, the meat itself was bland and could have been cooked to a less rubbery state. We ended the meal with mochi (mango and green tea flavors) and tempura ice cream. Both dishes were fantastic, completely satisfying any sweet tooth cravings. 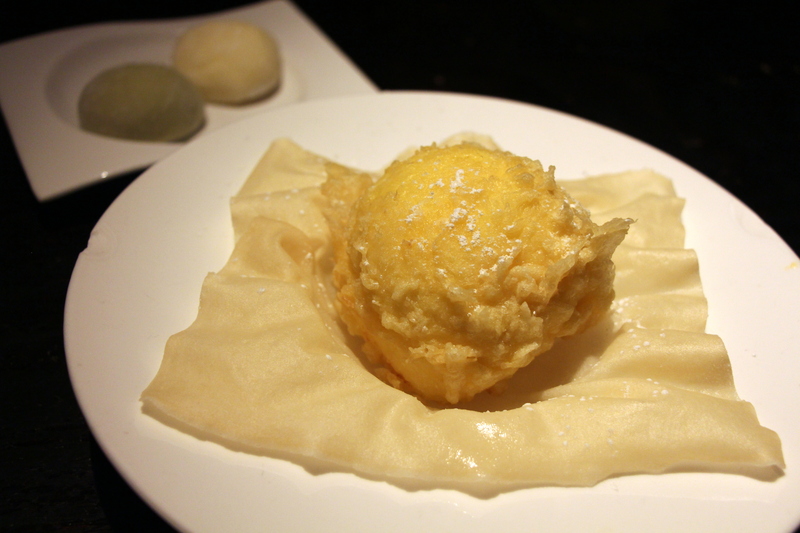 Both pieces of mochi, with their soft, squishy exterior and creamy ice cream-filled interior, were truly refreshing. We had never tried tempura ice cream before and ended up loving it. 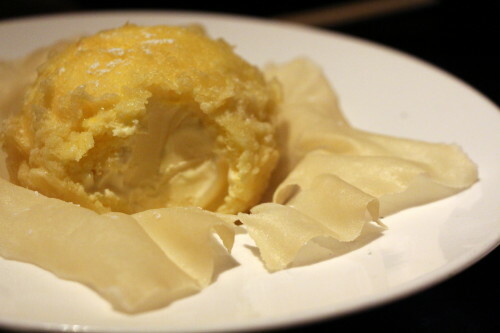 The tempura ice cream was served on an ethereally-light fried dough wrapper, with a crunchy outside and vanilla ice cream inside. This dish reminded us of carnival food given the fried coating and we loved the texture contrast. Overall, we were pleased with our visit to Yakitori Boy. Although some of the dishes were less than impressive, there were plenty of standouts, and this is definitely a great place to enjoy dinner before belting out some tunes at the karaoke bar upstairs. Mmmm the menu looks really good, especially the sea bass, the tokai roll, and the yakitori scewers! I’ve never heard of Yakitori Boy before, but I’ll have to check it out!